This is another recipe from Veganomicon. 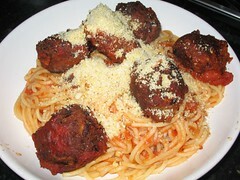 My husband is an absolute sucker for any kind of spaghetti and fake meatball dish when we go out, but I don’t recall ever trying to make one at home. There had been a lot of discussion on the PPK that people were having trouble getting their balls to stick together, or that they didn’t like the texture so I was a bit unsure but decided to give it a try anyway. My first problem came with a 20oz tin of kidney beans. What on earth size of tin is that? I used 2 normal tins and hoped for the best. 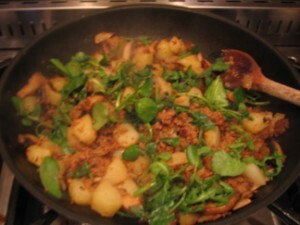 The other ingredients are simply herbs, spices, garlic, soy sauce, lemon juice and flour. They formed as balls perfectly, then you either bake or fry them with a bit of the tomato sauce that you use for the spaghetti. Of course, I opted to fry mine and they were a bit soft and squashy but held together OK. I liked this dish but I didn’t totally love it. The flavourse were good but the balls were a bit soft for me; I’d have preferred a bit more of a crunch to them. I would try the basic idea again but play around with it a bit. Sunday afternoon in Derby is not the most thrilling prospect for a vegan lunch, so I had a huge breakfast before I went. I had toast and marmite, with a sort of hash. I crumbled up leftover burger in with fried onions, potatoes, spinach and grated carrot, and served it with lots of hot sauce. It was delicious. 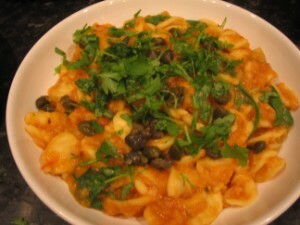 When I got in from the match I decided to make a pasta dish from Millennium – orechiette with lentils, lemon and rosemary. It’s quite a straightforward recipe considering how complex some of the dishes in that book can be. The sauce is basically red lentils, chilli flakes, tomatoes, rosemary and lemon, then right at the end it has spinach, capers and parsley added to it.